Unlike California, there are no state-enforced requirements for firearms storage in Washington State. However, if a firearm is stolen and then used in committing a crime, you can be culpable if it was not stored in a responsible manner. Which is to say, a belongs in a safe. 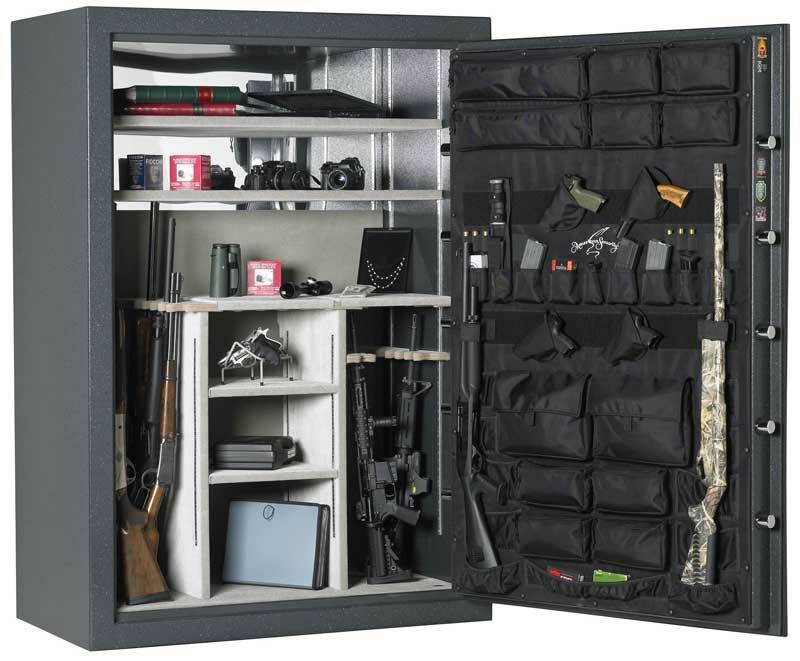 There are 3 types of firearm safes, none of which actually qualify to be called "safes", because they do not provide adequate fire protection. Handgun safes. 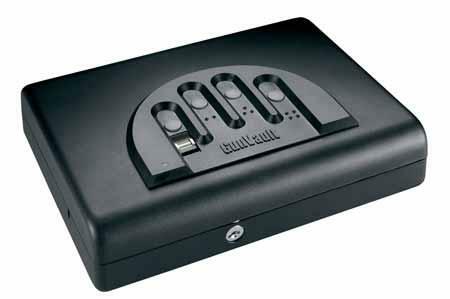 These are small metal boxes, sometimes equipped with biometric devices that are designed to store one or two handguns securely in the bedroom. They provide no protection against fire and little to no protection against theft, as they can usually be ripped out and carried away. They do provide protection against kids. Gun cabinets. 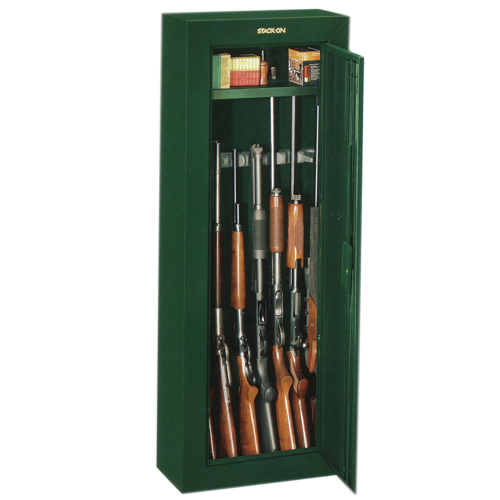 These are metal cabinets, usually with one shelf above the main space for storing handguns and ammunition, advertised to store 8, 11, or 14 guns, rarely more. They are relatively light and have no fire liner. They provide no fire protection and limited protection against theft, as in most cases they can be carried away easily. The prices range from about $130 (8 gun model) to $250 (14 gun model), and the StackOn 8-gun model can be often found on sale at Sports Authority for $100. Gun "safes". These are heavy steel boxes that advertise storage for 10-48 guns. They are usually heavy (hundreds of pounds) and have fire liner. However, it is important to note that none of them are certified as fire safes by UL. Instead, they are certified as "residential security containers". Which means decent protection against theft, especially when bolted to the floor, and very limited protection against fire. Many of these "safe" companies employ fly-by-night rating agencies whose certification is not nearly as thorough as that provided by UL, and so fire certification on them should never be trusted. This is true universally, even for the most expensive brands. For brevity, however, I will keep referring to the residential security containers that the firearms industry calls "safes" as, well, "safes". Pick the one that works best for your intended use. To determine your needs, here are a few questions to ask yourself. Do you really need theft protection, and is paying extra worth it? The answer depends on crime incidence rate in your community and the cost of your gun collection. If you have a hunting rifle that is worth $300, a shotgun that is worth another $300, and a pistol worth $600 - to the total of $1200 - perhaps buying a $1500 "safe" to protect them does not make sense. Your expected theft loss is the value of the asset times the probability of a theft. If you live in a crime capital of the world, you might expect that the probability of theft is 10% - which is really, really high. Then the expected loss for your collection would be only $120. A gun cabinet might do just fine. Note that most thefts are hit and run affairs where thieves are not really equipped to deal with even the slightest protection - they just grab what's on the surface and run. If your guns are in a cabinet, and the cabinet is hidden in a closet, and it is bolted to the floor or a wall, the probability that your collection will be harmed is very, very low. The other way to look at it, if a lifetime probability of a thief to penetrate a $750 Costco gun "safe" is 1%, that "safe" should be storing $75,000 in guns to be practical :-). Do you live in a house or in an apartment? If you live in an apartment, you might move a few times. Moving a heavy "safe" is no picnic. You might want to stick with a gun cabinet. How many guns are you going to store? Capacity claims by "safe" manufacturers are hogwash. It is usually impossible to tetris 8 guns into an 8 gun "safe", especially if ability to retrieve a gun without bruising it is desired. This is true with unscoped guns, and doubly true with scoped ones, which are, of course, almost always the majority these days. Always buy at least 30% more capacity than the number of guns you want to store. In other words, an 11-gun "safe" will store no more than 8 guns, and, depending on the size of the guns, probably fewer than that. Chances are, you will buy many more guns than you initially expected, this is a very addictive hobby! Half of US gun owners report having more than 4 firearms ( http://injuryprevention.bmj.com/content/13/1/15.full). If you own a house and do not expect to move, it may be prudent to buy a "safe" with maximum capacity upfront, since the price might be only marginally more expensive. Costco regularly has Cannon 48-gun "safes" for $700-$800. By comparison, an 11-gun "safe" might sell for $400-$500, and a 24-guns "safe" for $500-$600. Of course this does not apply if you live in an apartment and have to be concerned with mobility. Prefer mechanical locks to electronic locks. They tend to be more reliable, and drilling the "safe" to replace a broken lock can be extremely expensive. If the purpose of the "safe" is to store a gun collection long term, "safe wear", which is bruising of gun finishes when they bump into each other going into and out of the safe, can be significantly reduced by employing gun socks. A bunch of guns wrapped in gun socks can bump into each other without damage to their exteriors. "Safes" constantly come up on sale at Costco's internet site (free delivery!) and at Sports Authority. Guns are made of steel and they rust, especially in high humidity climate. A simple 900 gr silica dehumidifier will provide months of protection even to the largest safe. It costs roughly $25 on eBay, and can be reactivated after absorbing its fill of moisture by baking it in an oven for an hour or two. All lubricants eventually evaporate. 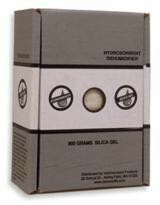 If you store guns for extended periods of time without reoiling them, prefer gun grease. See here for more. Most home insurance policies do not provide adequate firearms protection. Ask your agent about a supplemental insurance.